KA by Cirque du Soleil Las Vegas is one of the more unique Cirque shows on The Strip that you can attend. This 90-minute extravaganza has a great storyline along with the fantastic acrobats and aerial artists that guests have come to expect from the creators. The stage within the venue at the MGM Grand Hotel and Casino is enormous, intricate as well as a mechanical masterpiece. KA will please the audience as the performers move from choreographed martial arts fight to a ship that sways in a storm on the open seas to heroic scenes which touch the heart. 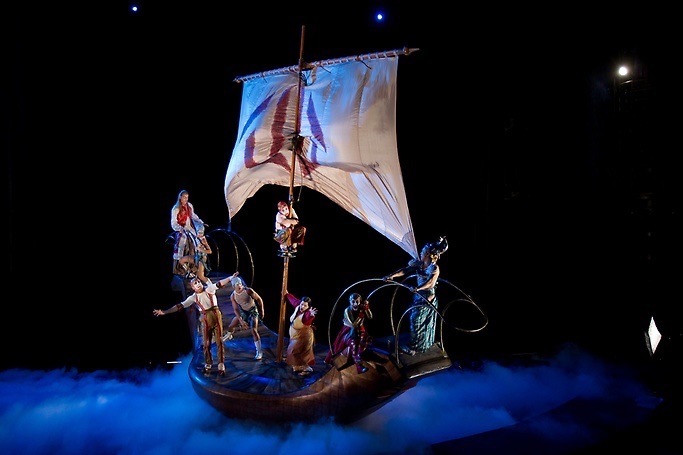 The storyline is easy to follow in the production of KA by Cirque du Soleil . The opening portion focuses on the introduction of a royal twin brother and sister sailing on a royal barge which eventually docks to a grand celebration that reunites the royal family. The party includes plenty of acrobatic expression that turns into a war scene with a rival tribe which leaves the Emperor and Empress dead on the stage. The twins flee the battle in different ways, the brother by foot and the sister by boat. As they escape the sister sails into a devastating storm which throws her housemaid over board forcing the sister to dive in the water and save her friend. As the show progresses the shipwreck crew and the sister awaken upon a sandy beach where they battle with giant snakes and other mystifying creatures. The brother during this time is traveling with his Court Jester where they hide in caves and encounter treacherous obstacles to pass such as an icy mountainside. The brother and sister endure through the hardships of nature with incredible aerial escapists as well as several martial arts battles that feature fantastic body movements of the performing cast. Another side bar of entertainment in the storyline is the Evil Counselor who is planning to overthrow the twins from power of the kingdom. The Evil Counselor has many tricks up his sleeve but none bigger than the death machine he is constructing. The machine is huge with cages, pendulums and wheels that take performers for wild rides as the platform rotates and tilts. The finale of KA is an epic fight between good and evil that features lots of acrobatic martial arts and aerial stunts with swords, spears and other devices of war. During the warfare on stage, the twins overcome the Evil Counselor and the rival tribe agrees to peace, thus reuniting the kingdom. The production ends with a big celebration that is filled with jaw dropping stunts. 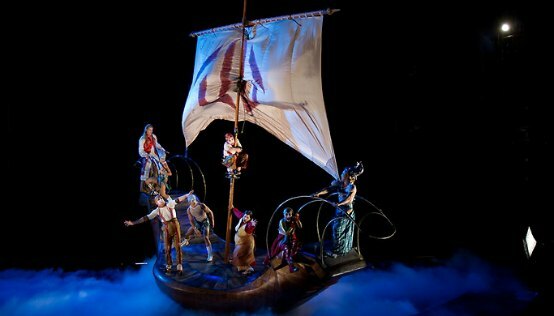 The choreography of KA by Cirque du Soleil is astonishing from the mechanical platforms to the storm riding ship to the death machine. 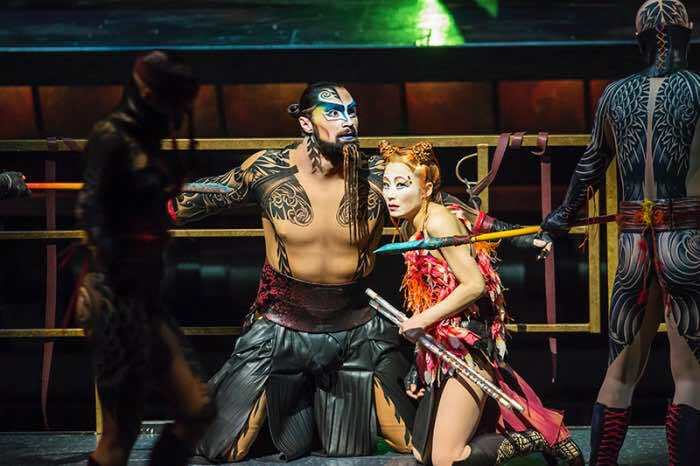 The costumes and storyline has a Genghis Kahn feel and the flamboyant use of weaponry during the show by the cast does involve very many intricate movements. The lighting and soundtrack highlight the mystical aspects of the show. Probably the most amazing portion of KA is the stage that was constructed with several mechanical platforms that lift the talented artists into precarious positions during their artistic performance of acrobats, aerial stunts and dancing. The main hydraulic platform-known as the Sand Cliff Deck-raises, spins and tilts into various positions that force the entertainers to adjust their body movements in order to stay on their feet. 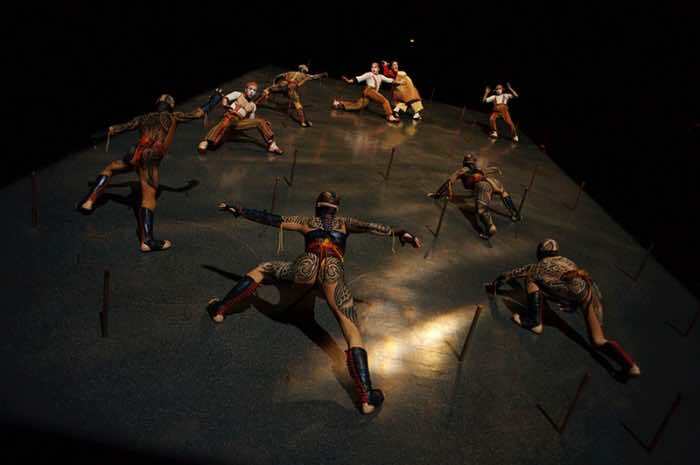 The 360-degree rotating platform enhances such scenes as an acrobatic martial arts fight with swords to a delicate performance of puppets. The stage platform also supports a tremendous scene with an ocean going vessel caught in a ferocious storm which rocks back and forth due to the motion of the artists. The scene is captivating as the artists gracefully maneuver the 1,800 pound ship throughout their fabulous performance. There are smaller mechanical platforms, one of which is called the Tatami Deck, that can also move on its own as well as join the Sand Cliff Deck for larger performing area. The fifty ton mechanical platform is absolutely amazing to watch during KA by Cirque du Soleil. The MGM Grand spared no expense when constructing the KA Theater specifically for KA by Cirque du Soleil. At $165 million the theater is one-of-a-kind with its rotating hydraulic platforms, multimedia effect equipment and sound system. The sightlines in the 1,950 seat venue are great. Guests will be pleased with the mechanical apparatuses and the value the stage brings to the overall production of the show. KA is an adventure for guests. The storyline, the acrobatics and the choreography are leaving audiences in amazement after witnessing one of the most intricate Cirque du Soleil shows of all time. KA by Cirque du Soleil includes over eighty cast members performing during the show that are talented acrobats, aerialists, contortionists and dancers. These cast members are put into motion by director Robert Lepage and choreographer Jacques Heim. The main characters of the production are Jennifer Haight as the Twin Sister, Cheri Haight as the Twin Brother, Kleber Conradoberto as the Court Jester, Gail Gilbert as the nursemaid and Jorg Lemke as the Evil Counselor. 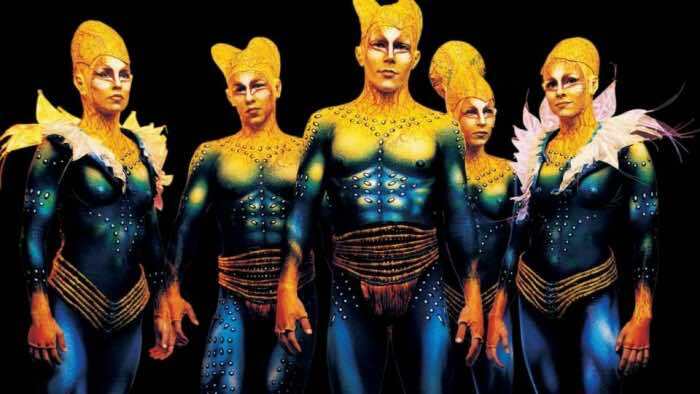 Other cast members that might perform during KA by Cirque Soleil are Ge Bai, Sabu Alegria, Jeana Blackman, Hubert Gall, Julie Duflos, Yan Chao, Johan Guy, Peng Guo, Zhong Zhi Lu, Dan Hong Li, Victoria Lubecki and Reinaldo Noguti. 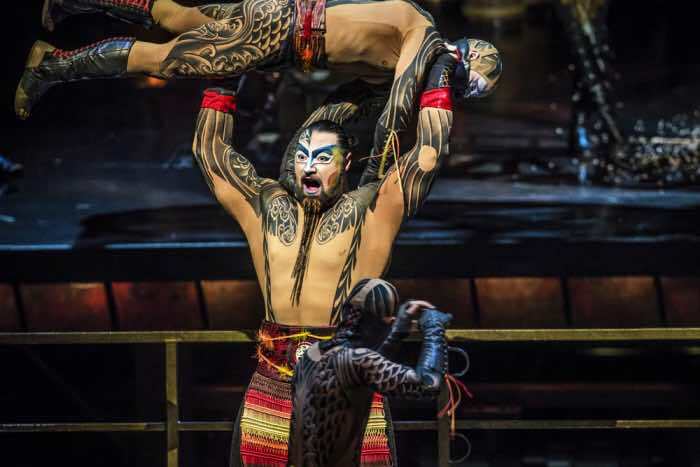 KA by Cirque du Soleil is running at the MGM Grand Hotel and Casino within the KA Theater. The theater is a great venue that seats less than 2,000 guests. The mechanical platforms, multimedia effects and sound system within the theater are a unique experience in itself. The show is open to patrons over the age of five. There are two performances of KA Saturday through Wednesday at 7:00 P.M. and 9:30 P.M. Ka Cirque Du Soleil Tickets are on sale now with general admission balcony seats tickets and a spectacular VIP experience.